Sunny Deol's 1984 hit !!! Manzil Manzil ??? 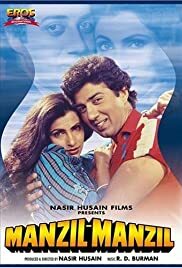 Mr. Malhotra (Kulbhushan Kharbanda) wanted to start a factory, he needed money for this, so he went to Gautam (Danny Denzongpa) and borrow RS 10 Lakh from him on condition that he returns the money in one year's time and that if he is alive his only daughter Seema (Dimple Kapadia) shall marry Gautam son. One year past and when Mr. Malhotra went to return the money, he couldn't find Gautam, nor his wife, nor son, they had all move to an unknown surrounding. One day while traveling on a lonely country road Seema happen to meet a stranger and taught it was Gautam son and decides to marry him under her father's condition. But when she went to New Deli, she happen to meet a man named Vijay and both fell in love with each other, then Mr. Malhotra reach up with smuggler and gangster called Niranjan Das (Prem Chopra), whom was convinced for his son Roopesh to marry Seema. But Seema only swears to marry Vijay and she dears not to break her promise. After that Seema had an accident and looses her memory, but her lover Vijay develops such a plot which will only bring Seema to justice and removes all enemy out of the way.